This building was released in the January 24th, 2017 update. It is unlocked by completing skirmish 8. Inside the Labyrinth, you find Dark Frostwings and rarely Gem Gremlins. There are 2 difficulties: Normal and Elite. Special packages may include [Labyrinth(Elite) Access], you can purchase the package to unlock Elite difficulty. "Only the light of Holy Star can hurt the creatures of the Labyrinth." it means if you want to damage the monsters, you must be used a currency called holy stars. Normal: Each attack requires 100 Holy Stars; you will get a reward after every attack. Elite: Each attack requires 1,000 Holy Stars; there will be a huge reward for every attack. Each hit grants a reward where the Elite hits have 11 times the reward of a normal hit though. Rewards are mostly resources but can also include quest scrolls and Bravehearts. The Dark Frostwing takes 10 hits to be defeated and usually another Dark Frostwing shows up in its place. Sometimes, however, a Gem Gremlin (aka boss or divine guardian) appears instead, where the prize for hitting them is 300 to 500 gems and they typically run away after a few hits. Note: it can take tens of thousands of gems of stars to get one to show up only to get less than a thousand back; this is not a place to invest gems use the Treasure Trove for that purpose. It is unknown how many hits they can take but defeating them should grant a jackpot payout (the last three winners are indicated on the right side of the Labyrinth, and winners in your kingdom have a marquee message show up when the win). Like any gamble or lottery there are many entrants but very few winners. Holy stars can be purchased for various exchange rates ranging from 10 Holy stars for 30 gems to 10,000 Holy stars for 20,000 gems. 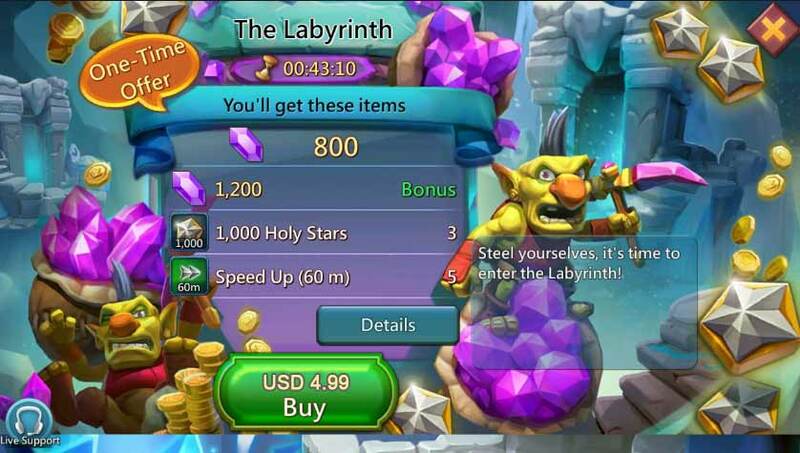 Alternatively, you can purchase through Special Bundles in the store, that will give you Holy Stars and Gems. This would be the most cost-effective method of obtaining Holy Stars. Occasionally you can obtain them as rewards from monster hunts. Labyrinth Alert: The Dark-Frostwing is replaced by another monster. The drop table is changed slightly to contain ultra rare materials for four types of monster. Next Next post: Lords Mobile Special Event: A New Challenger has Taken Over the Labyrinth!